Mike surprised Erin, Charmaine Barton and myself with coast guard appreciation certificates for our collective work on the "VBA 100" project, and it was also a great way to close out my career and a day that I will never forget! A lot of hard work and long hours were put into this project, and many people in Central & Arctic coast guard region need to be acknowledge. My heartfelt thank you's to Regional Operations Superintendent Peter Garapick because without his support we wouldn't have had the funds to pay for anything; OIC Michael King who was the liaison between RHQ and the VBA 100 team; Regional Communications Officer Carol Launderville who organized the media event side of things; DFO Communications Manager Theresa Nichols who filled in for Carol (on short notice); AC (C & A) E. Wade Spurell who stood in for the Commissioner of Coast Guard who had a scheduling conflict, and MCTSO Peter Fraser who spent many hours at the National Archives Library (Ottawa), and helping Erin with her research. 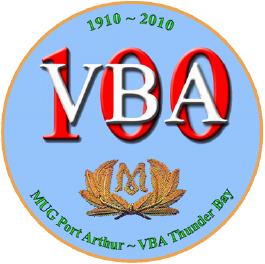 To the members of the VBA 100 team, MCTSO's Erin O'Brien (research) and Charmaine Barton (genealogist), what can I say? Without their help very little could have been accomplished because they had the skillsets we needed. It took us 18 months of hard work to reach this day, and then it went by went so fast! Erin was nicknamed "The Ferret" because if she couldn't find something, it never existed! Finally, very special thank you's to Dr. Tory Tronrud, curator of the Thunder Bay Museum, and Ms. Sara Janes, Thunder Bay City Archivist, for their invaluable research efforts in providing records, photographs, and newspaper references. Dr. Tronrud also spent his time and talent in editing and providing photographs for my article: "SS DUNELM & Port Arthur: First Rescue by Wireless". 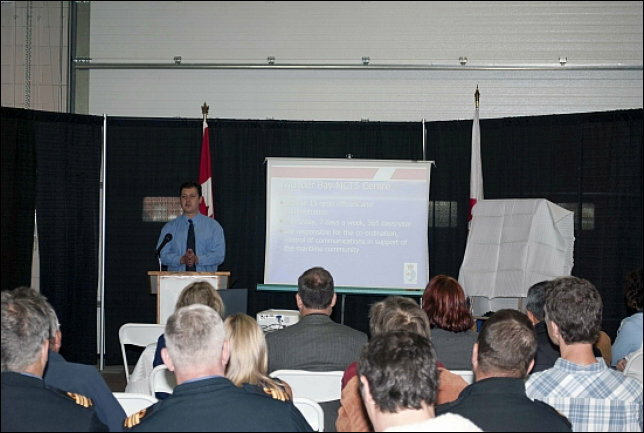 OIC Michael King making his presentation about the services Thunder Bay MCTS and the Canadian coast guard provides to the public. 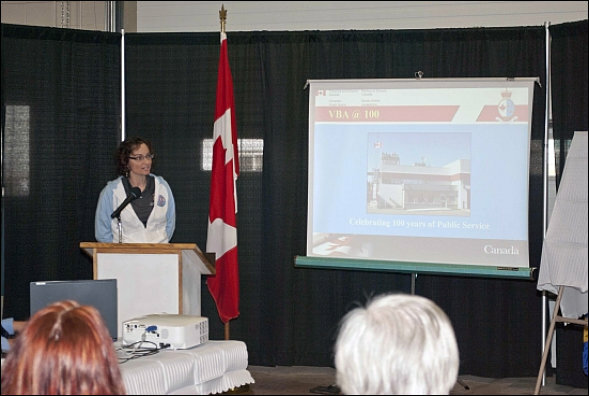 MCTSO Erin O'Brien presenting the VBA 100 history from the early Marconi days to the present. AC (Central & Arctic) E. Wade Spurell and I unveil the VBA centennial plaque. I wasn't aware that Mike planned to ask me to assist Wade. An extra special day for me, indeed! 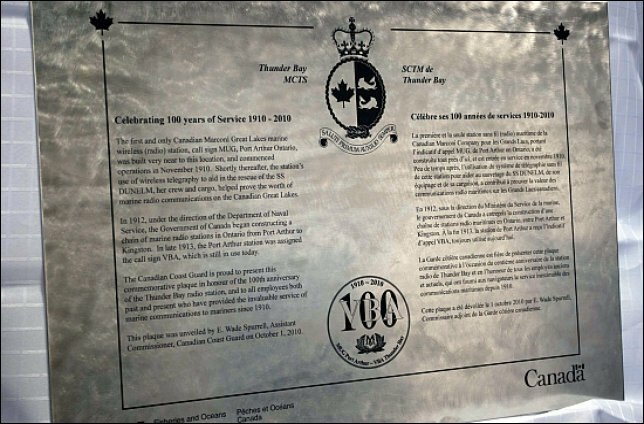 The centennial plaque is 18" x 24", laser etched on 1/4" stainless steel in English and French. It's projected lifespan is about 1,000 years—give or take a decade! Now framed, it hangs proudly inside the main entrance to the operations building. Friday, 1 October 2010, was a mild and sunny fall day, one-hundred years in the making! The event took place at the Keefer Terminal coast guard base with guests limited to 50 or so, including those who were past and present coast guard employees, local dignitaries, those involved in the marine industry, members of the Amateur Radio community, and the news media. 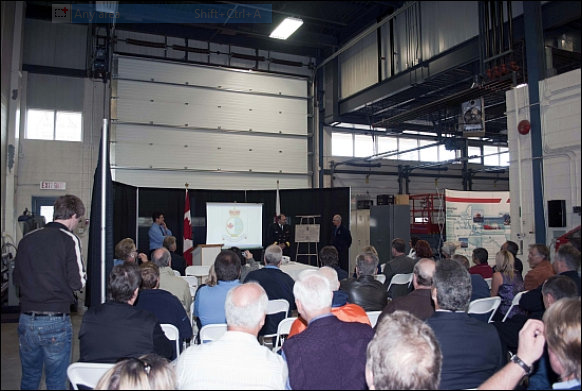 We created a few radio and marine static displays covering the past century of marine radio, along with a couple of presentations, and a tour of the MCTS Centre. OIC (Officer-in-Charge) Michael "Mike" King acted as Master of Ceremonies and started things off at 1100 hours by welcoming everyone. Missions to Seafarers chaplain Reverend Ed Swayze gave a prayer in the form of a standard "3x3" radio call, asking for the Lord's blessing of the past, present, and future men and women involved in the marine industry. Mike gave a short presentation about Thunder Bay MCTS and services the coast guard provides, followed by MCTSO Erin O'Brien who gave the MUG/VBA 100 history presentation. She had already presented this twice: for the Thunder Bay Heritage Advisory Committee, and at a coast guard media event, so her delivery was flawless. Erin's sister works in advertising and helped us create a professional presentation package. This was followed by the unveiling of the station centennial plaque, laser etched in stainless steel. I was taken aback when Mike asked me to unveil it along with the Assistant Commissioner of Coast Guard (Central & Arctic) E. Wade Spurell, who was standing in for the Commissioner. "Ambition can creep as well as soar." Personal web site. Not affiliated with any agency. Copyright © 2000-2019 R. C. Mazur, VA3ROM.